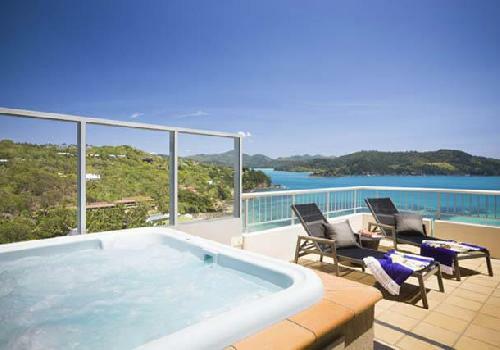 Staying at the Hamilton Island Reef View Hotel you will find yourself surrounded by tranquility and relaxation. The property is conveniently located on the northern resort section of the island and is just a short walk from the magnificent sands of Catseye Beach and overs 20 kilometres of exciting bushwalking tracks. You will also be able to take advantage of the complimentary use of catamarans, paddle skis, windsurfers and snorkelling equipment that the island provides guests with. A popular things to do whilst you are holidaying on Hamilton Island is to take a day trip out to Hardy Reef, which is the home of Heart Reef on the Great Barrier Reef. All of the acccommodation at the Hamilton Island Reef View Hotel has been well appointed to ensure that you have a memorable and relaxing stay on the island. The rooms feature air-conditioning & ceiling fans, a private balcony for you to relax on, an ensuite bathroom with shower and separate bath, TV, mini bar, in-room safe, daily housekeepin and much more. The Hamilton Island Reef View Hotel also has a range of resort facilities such as complimentary return airport transfers, lounge bar, pool restaurant, tour desk, business centre, 24 hour reception, 35-metre swimming pool and room service. Whilst you are staying at the Hamilton Island Reef View Hotel you can spoil yourself with fine food and wine whilst watching the sun set over the Coral Sea, take a day trip on the to the Great Barrier Reef, charter a yacht and sail around the Whitsunday's 74 tranquil islands, race a go-kart like a Formula 1 driver or roar along bush trails on a quad bike, visit to the Hamilton Island shooting range, play a round of golf on one of Australia's premier courses, go diving with tropical fish, play beach games by the sea, relax on the sands at Whitehaven Beach or make the most of the fully equipped gymnasium complete with weights and cardio gear.